This post is part of a series by a group of California Kid Bloggers on exploring the California Missions. Over the next few months California's missions will be featured by various bloggers. You can follow along here. In the almost three years that we've lived in the Bay Area we've visited San Francisco's Mission District many times. But it wasn't until this Summer that we finally made it to the neighborhood's namesake. Most commonly referred to as Mission Dolores (after a nearby creek, Arroyo de los Dolores), Misión San Francisco de Asis is the oldest intact building in San Francisco. Mission Dolores (as I shall refer to it) was the sixth mission established under the direction of Father Junípero Serra, a Spanish Franciscan monk who established the first nine of California's twenty one missions. The original settlement was founded on June 29th 1776 and named for St Francis of Assisi, the founder of the Franciscan Order. The first mass was celebrated on this date in a makeshift shelter. Formal establishment of the mission came a few months later in October with the original building being a log and thatch structure. Construction of the mission chapel we see today took place from 1782 - 1791. The 4 feet thick walls are made of adobe bricks that were formed and sun-dried nearby. It is estimated that 36,000 such adobe bricks were required to complete the 114 feet long and 22 feet wide building. Today the mission chapel features a small museum in which the inside of such brick work can be seen. While the outside of the mission chapel is relatively simple the interior is quite decorative. The ceiling, which is my favourite feature of the chapel, was painted with local Ohlone Indian designs using vegetable dyes. What we see today is has been repainted but stays true to the original design and colors. Originally a mural painted by local Ohlone people adorned the focal wall. This was covered in 1796 by the decorative altar, or reredos, that was brought from San Blas, Mexico. The two side altars, also from Mexico, were brought to the mission in 1810. Their columns appear to be made of marble but are in fact made of wood. Much of the gold leaf adorning the altars is original. The chapel's simple baptistry is still in use today. The pattern from the chapel's roof beams has been repeated on the ceiling of the alcove that houses the baptismal font. A large segmented painting adorns the wall opposite the baptistry. Admittedly, I have not been able to find any information regarding this painting. If anyone knows anything about this piece I would love to hear about it. The mission chapel was originally part of a complex of buildings used for housing, agricultural, and manufacturing purposes. While much of this complex has since been demolished or altered over the years, the facade of the mission chapel remains relatively unchanged since it was dedicated in 1791. A diaroma, created for the 1939 World's Fair on Treasure Island, is on display in the courtyard and shows how the mission chapel and its surrounding buildings would have looked around 1791. Mission Dolores features a small museum which was completed in 1976 as part of the bicentennial of the mission. Artifacts from the early years of the mission (some replicas) are on display along with items depicting the life of local Ohlone and Miwok people and lithographs of the California Missions. Original roof trusses can be seen as well as a revolving tabernacle which was brought from the Philippines. The adobe construction technique of the mission can be seen through a small cut out showing the straw interior of the brick work. After a look through the museum we headed into the adjoining cemetery, the only cemetery left within San Francisco city limits. I know it's a little macabre but I love looking at old gravestones. I make it my mission to find the oldest. Most gravestones seen in the cemetery today date from the Gold Rush era of the mid to late 1800s. Approximately 5,000 Ohlone, Miwok and other First Californians who built the mission and were its earliest members were also buried in the cemetery. Mission Dolores is also the final resting place of many notable historical figures including Don Luis Antonio Arguello, the first governor of Alta California under Mexican rule, and Lieutenant Jose Joaquin Moraga, the first commandant of the Presidio and leader of the 1776 expedition that founded the mission under the direction of Father Junípero Serra. Lieutenant Moraga's burial place is marked out within the mission chapel itself. A statue of Father Junípero Serra marks the focal center point of the cemetery. This statue was sculpted by early californian artist Arthur Putnam and installed in the cemetery in 1918. The cemetery has been consolidated over the years and is now much smaller than it was in the past. With the consolidation unidentified bodies were reverently buried in a common grave on site. Today most of the original cemetery grounds are buried beneath a paved playground behind the Mission Dolores School. What remains of the cemetery was carefully restored in the mid-1990s. Just for fun, and completely off topic, let's see if you can spot the gravestone that I thought said "Boogers" at first glance! The cemetery features a replica of an Ohlone hut. It was an incredibly windy day when we visited Mission Dolores and Ava and Lola were pretty happy to hide out inside the hut away from the wind as I explored the cemetery. From the cemetery we headed to the adjoining Mission Dolores Basilica. While the adobe mission chapel fared well during the 1906 earthquake and fires, the neighboring brick parish church was completely destroyed. The present building was completed in 1918 and further remodeled in 1926 in the Churrigueresque style inspired by the Panama-California Exposition held in San Diego's Balboa Park. It towers above the tiny mission chapel and features beautiful ornamentation including many stained glass windows depicting the missions of California. In 1952 the church was elevated to the status of Minor Basilica by Pope Pius XII making it the fifth basilica designated in the United States. Mission Dolores is located at the intersection of 16th and Dolores Streets in San Francisco's Mission District. 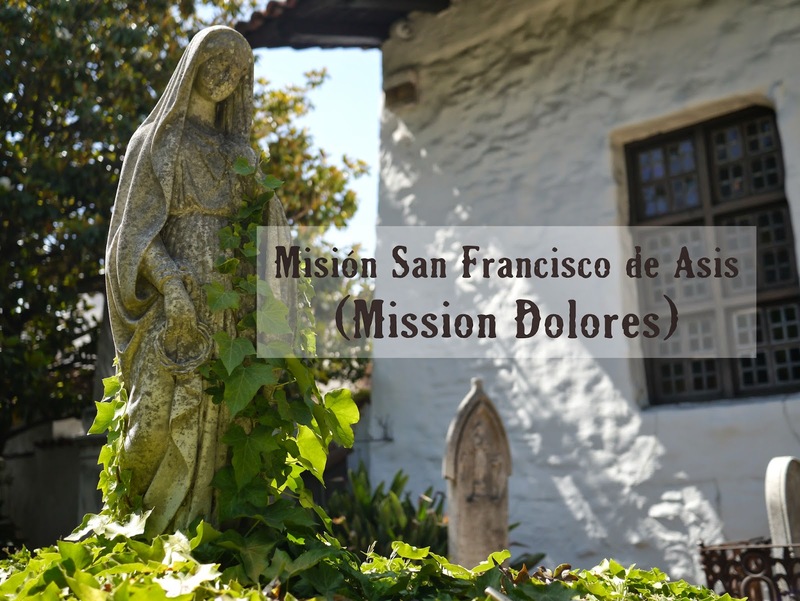 For visitor information including opening hours, entry fees and service times please visit the Mission Dolores website here. Don't forget to follow along with our series on Exploring the California Missions! Big thanks to Leanna of All Done Monkey for organizing this series. This looks like such a fascinating place, thanks for showing us around it!